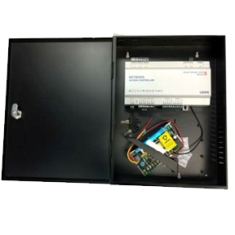 Single Door Access Controller w/ Power Supply and Metal Box | Web Based Access Controllers | iACC1DMP | | iLink Professionals, Inc. The iACC1DMP is a Single Door Network Access Controller within a metal box that provides an efficient, highly secure way to control access to your premises. In other words, you can ensure that only people with permission to enter are allowed to enter. This single door access control panel can connect up to 2 readers (only operable for 1 door). You can connect this controller up to an electronic door lock for example, magnetic locks and door strikes. You will also be able to integrate with our iFSR01 sirens, iSRO strobes, Readers & Exit buttons, or even our iSVDBWIFI smart Wi-Fi doorbells. You can even add new users, configure access control proximity cards, create times when the door could be accessed, and so much more.